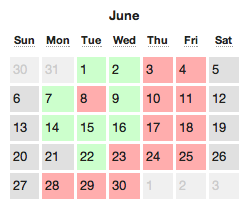 Clicking on an individual day in the calendar will take you to that day’s page in the Journal View, so you can review the individual trades on that day. We can see very quickly that every single Thursday and Friday in the month was a losing day. We can then take a closer look at those days, and use the detailed reports to drill down and understand what might have been happening there. 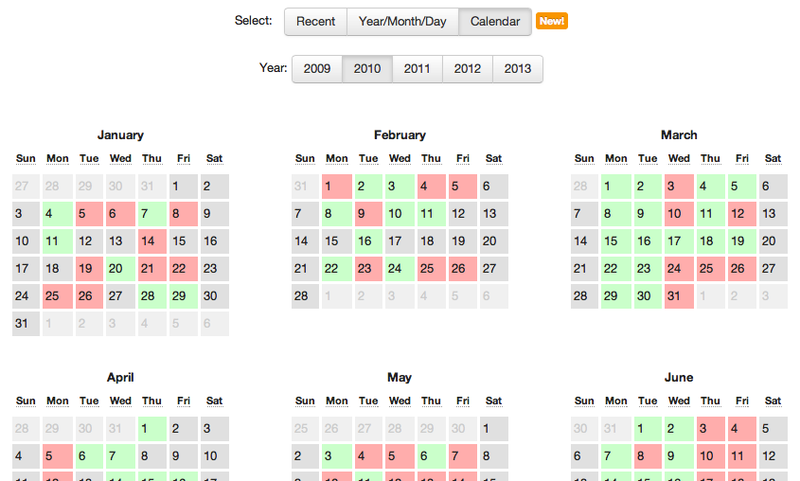 Calendar reports are available now for all users! Tradervue now supports importing trades from X_Trader! From the Tradervue Dashboard, click Import Trades, select X_Trader, and follow the instructions. If we don’t yet support your broker or trading platform, let us know and we may be able to add support. 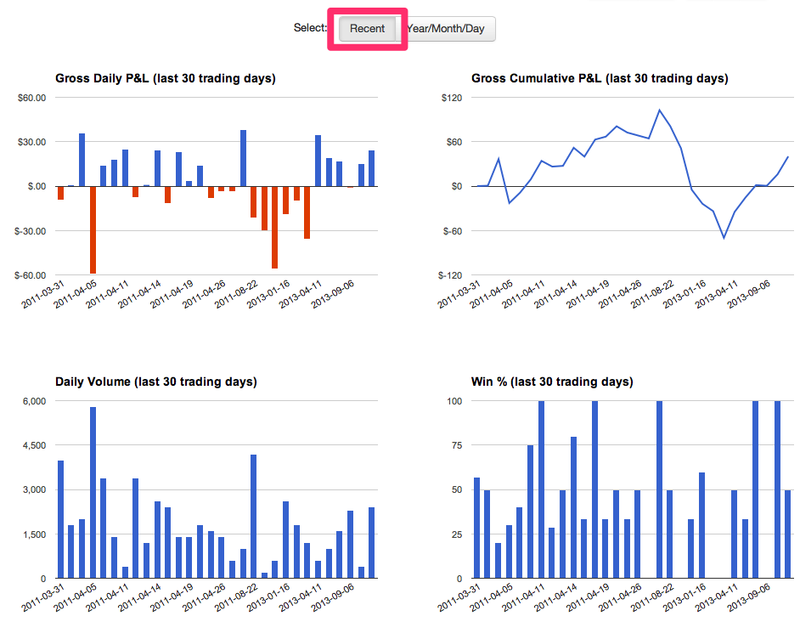 Today, we have overhauled the way Tradervue works for swing trades (or any multi-day trade). There are some small changes for intraday traders as well. When Tradervue was first released back in 2011, its feature set focused on the needs of active intraday traders. Since then, we’ve enhanced these features dramatically…but over time, more and more traders were using it for overnight (or longer) trades. So now, we’ve gone through and made it work much better for these folks. 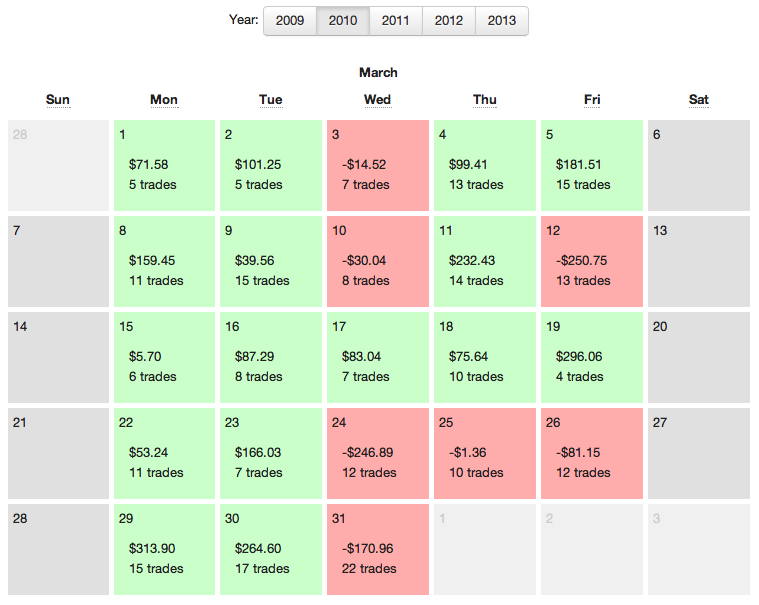 In the Trades View, the date in the left column is always the entry date of the trade. Additionally, when you use the filter to filter your trades, the start/end dates will filter on the entry date. Realized P&L is calculated using a First-in, first-out (FIFO) methodology. Note the label in the left column shows “opened”, which means this trade was opened on this day, and remained open. The P&L for that trade ($652.00) is the realized P&L for the trade on this day – if you refer to the trade detail above, you’ll see this is from the covering of the first 100 shares. 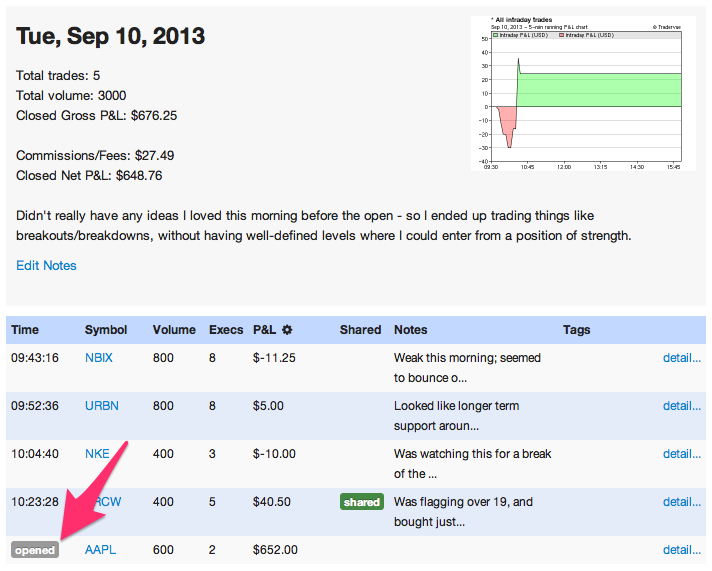 The total P&L data for the day includes this value, since it has been realized. Here the left column says “adjusted”. 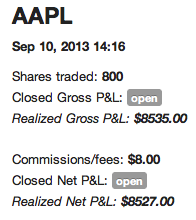 The P&L shown for that trade, and for the day as a whole, is the P&L realized from this trade on this day only. The left column shows “closed”. The P&L shown here is the P&L realized for this day only; it is not the total closed P&L for the trade (that total is shown on the Trades View, and the trade detail). In a nutshell, the Journal View breaks things down by day, and every day you touch a trade you’ll see an entry there, showing what happened and the realized P&L for that date. You can make notes on each of those days if you wish, and you can see how your P&L for a trade was realized throughout the trade’s lifetime. The Dashboard will show the same opened/adjusted/closed data as the Journal View, except just for the most recent trading day. In the Recent report group, the Gross Daily P&L and Gross Cumulative P&L will now show P&L as it is realized, as opposed to on the entry date of the trade. The Daily Volume report will now show volume on the day it occurred. The Win % is based on the trade entry date. 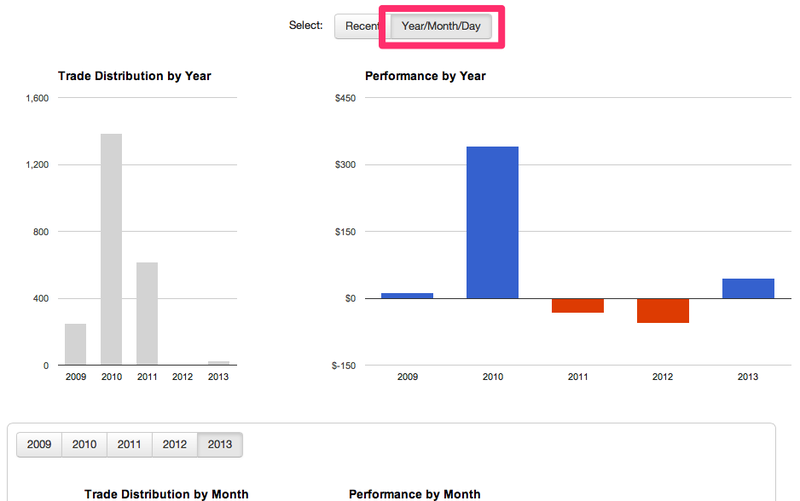 On the Year/Month/Day report group, all P&L is now shown on the date it was realized. The Detailed reports use the trade entry date for their calculations, with the exception of the Cumulative P&L and Cumulative Drawdown (in the Win/Loss/Expectation group), which use realized dates. The Win vs Loss Days and Compare reports are calculated in a similar manner to the Detailed reports. Advanced reports use the trade entry date, in cases where a date is relevant. For trades that are settled in other than USD (e.g. Forex and Eurex futures), Tradervue calculates P&L in the native currency, and then converts to USD for reporting. In the past, this conversion would be done using the exchange rate at the time of the closing execution of the trade. Now, each time there is realized P&L in a trade (e.g. each execution in the closing direction), the exchange rate will be determined as of that execution time. In the case of long-running trades, during which the exchange rate may move considerably, this improves the overall conversion accuracy for the trade. Tradervue now supports importing trading data from MetaTrader 5 (MT5)! As always, click Import Trades, select MetaTrader5 from the list, and follow the instructions. If you don’t see your broker or trading platform on our supported list, let us know and we may be able to add it for you! The price MFE/MAE calculations will also be shown with additional precision for these instruments. If you’ve been using Tradervue with these stocks, this should be a big help for you! In one of those updates that 99% of you won’t care about, but will make the other 1% breathe a huge sigh of relief, we’ve added some things to the emailed Tradervue payment receipts you’re getting if you’re a silver or gold subscriber. Most important of these is the ability to enter any optional contact information that you’d like to appear on every receipt. If you need your company name on the receipt, or your VAT identification number, or anything else, you can now add it. From the Dashboard, click Settings, go to the Plans and Billing tab, and you can fill in the section called “Optional contact information”. Whatever you enter there will appear on every payment receipt you get from us.